We offer specially designed Vibrating Screen that find usage in various applications. Our range of vibrating screen separators comprises of gyratory screen, circular motion incline vibrating screen, linear motion vibratory screen, vibratory conveyor screener and dewatering vibrating screen. These vibratory screen separators are widely appreciated for their lower maintenance, simple maintenance and upkeep, reduced down time, longer screen life and higher separation efficiency. 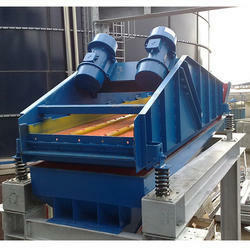 As per the customer’s specifications, we can custom manufacture all our vibrating screen separators. We are the leading manufacturer, supplier and exporter of Dewatering Vibrating Screen, Linear dewatering screen, and PU screen separator in India. This is one of our most versatile products which has a feed end, declined at 45° and the main deck inclined at 5°. This allows a thick bed to build & trap small particles. This allows simple drainage of water without carrying small particles through openings. It is one of the best dewatering screens available in the market. We strive to better this simple drive arrangement on larger horizontal & inclined dewatering screens. This provides the advantage of reduced maintenance, compactness and simplicity. Its drive mechanism produces a linear (straight line) motion while developing high acceleration ("g" forces). This augmented acceleration & reverse incline deck configuration is ideal for all dewatering applications. 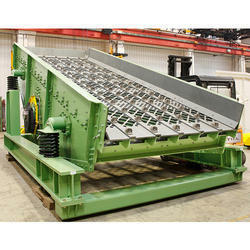 These dewatering screens can be fitted with elective electric counter-weighted motors and other features. Linear Motion Vibrating Screens are known as conventional high-performance screens of single or double-deck brute force linear-motion design has a confirmed track record in various process industries.